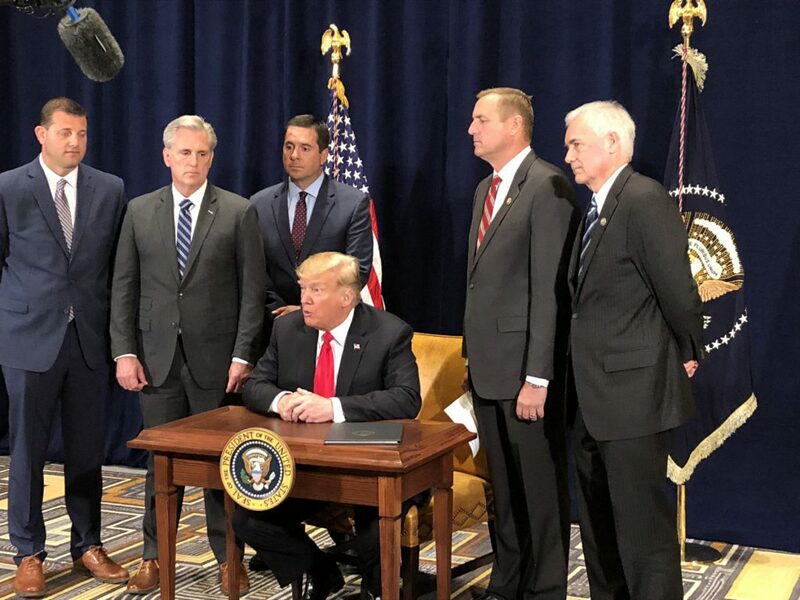 On Friday, October 19, President Trump signed an order streamlining the federal process that governs much of California’s water-delivery system. While this is definitely great news for California farmers, it’s also good news for all California water users. Let’s look at a few of the things Californians should know about this order. Breaking the bureaucratic logjam governing water policy is good for California folks, farms and fish. For decades, multiple federal agencies have exercised control over California water policy leading to conflicting regulations and uncoordinated regulatory actions which all lead to delay and increased costs. During his tenure, President Obama pointed out the obvious problems with one federal agency having control over salmon in fresh water and another when the fish is in salt water. The President’s order directs the agencies involved to streamline the process and remove unnecessary burdens. Ending this bureaucratic chokehold will make water delivery more reliable for all Californians. Science helps us understand how our ecosystems function and how to best balance the needs of all. It’s just common sense to make decisions impacting all California water users on the best, most current, science. In 2010 a federal judge noted that the U.S. Fish and Wildlife Service was using “sloppy science and unidirectional prescriptions that ignore California’s water needs.” The Ninth Circuit Court of Appeals largely concurred. Las week’s presidential order mandates that the agencies involved base decisions on the most current science, again benefiting all water users. Reaffirming our commitment to the Endangered Species Act (ESA) and providing more water to wildlife provides important environmental benefits. Many people are not aware that California’s San Joaquin Valley is rich with birds, plants, animals, fish and insects. Its rivers, streams and wildlife sanctuaries host millions of waterfowl, Tule elk, turtles, cranes, deer and many other species that call the San Joaquin Valley home. Much of California’s richest farmland also hosts important wildlife refuges. The president’s order specifically reaffirms the importance of the ESA in developing policy and sets timelines for environmental reviews. In addition, by freeing up water for the Central Valley it will bring water to wildlife refuges that are a critical component of the Pacific Flyway and have had insufficient water to meet the needs of millions of ducks, geese, shorebirds, songbirds and endangered animals. Removing barriers to building new storage projects helps all Californians. No large State or federal water storage projects have been built in California since 1979. Having more ways to store water in wet years for use in the dry ones, just makes sense for all of us. This order will speed the review process for storage and other important water infrastructure projects, greatly contributing to a secure water future for California. Preserving California’s ability to grow healthy food benefits us all. California farmers do a lot with the water they have. According to the Public Policy Institute of California, agricultural water use in the Golden State is down 15 percent since 1980 but production is up more than 60 percent. If we curtail their ability to grow safe, healthy food we’ll have to import more from other places. That’s both a national security issue and a food safety issue. It’s also bad for the environment to outsource our food production – Importing food to replace what we don’t grow at home means more ships, moretrucks, and more pollution. This order is not about fish vs farms – it’s about making a reliable water supply more accessible to all Californians.